Are you ready for something exciting from my youngest inventors? We have spent the last 3 art lab sessions learning how to create conductive circuits, hook up the Makey Makey, investigate instruments, design our own, and play them on computer speakers. Kindergarten used paper drawings with graphite pencil buttons. 1st grade used cardboard, paint, and copper tape. I taught them how to use Makeys first. With Kinders, we focused on “high five piano” and understanding how to make them work. First grade played with aluminum foil, playdoh, graphite, and high fives. I made this PDF, Tips for Teaching Circuits and Makey Makey, to help teachers think about how use Makeys in thier classroom. Then we looked into instruments with this YOUTUBE video. It plays a sound before sharing the instrument. We would guess them and talk about how they make those sounds. Then we would create our own designs. PRO TIP: If you want a real challenge, have 1st graders cut cardboard with kid scissors. Keep everyone’s frustration levels low by cuting your cardboard to managable rectangles and teach them how to cut away shapes. Chipboard also works well. Tape worked okay, but I ended up reinforcing many with staples. 1st grade was allowed to paint their instruments. The crayons worked better for Kindergartners. I had them add their graphite buttons in the last session before using the Makeys. After testing out how hard it was for one 1st grader to put on the tape, I ended up putting the tape on for the 1st grade. It let the kids focus on the Makeys, playing instuments, and using iPads to document eachother. PRO TIP: Kiddos can take a million pictures, but video is a challenge. I plug the ipad into the projector and show them live examples with filming. I give reminders constantly. I still end up with many 1 second videos. But its important to me to have them collaborate, stay engaged, and learn to document their own work. Having them experience the iPads as a tool in Kindergarten halts some of the incessant need to take a million photos in later years of class documentation. 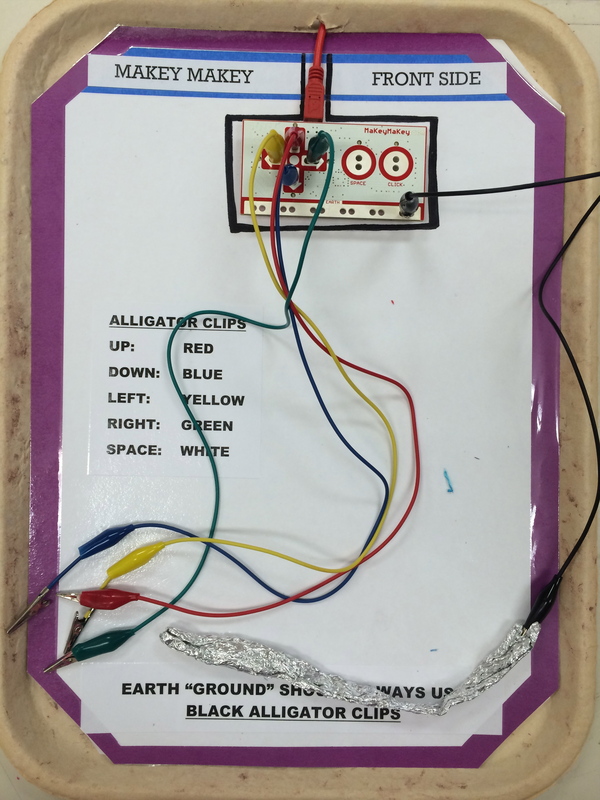 This entry was posted in 1st Grade, Kindergarten, STEAM Lessons and tagged Conductive, Critical Thinking, Engineering, Experimenting, Instrument Design, Makey Makey, Music, Sound, STEAM. Bookmark the permalink.